WASHINGTON, April 13, 2018—The World Bank's Board of Executive Directors approved today two emergency support operations totaling US$65 million for restoring agriculture livelihoods, strengthening resilience, and rebuilding houses destroyed by Hurricane Maria. This represents the World Bank's highest ever financing for Dominica and is part of a larger US$115million package of support. that includes financing of US$65 million in concessional terms and US$50 million in grant financing from the International Development Association's (IDA) Crisis Response Window*. As the eye of the storm wreaked havoc in the Caribbean island of Dominica, more than 30 people were killed and total damages and losses were estimated at US$1.37 billion or 226 percent of GDP. The greatest damages were in housing and transport, with more than 4,500 houses destroyed and 20,000 partially damaged, and many roads and bridges affected and covered by trees and flooded debris. The agriculture sector had the largest losses, with 80 to 100 percent of crops destroyed. Farmers lost half of their cattle and many fishermen lost their boats and fishing gear. "This financing enables us to make two critical investments in our economic recovery following the devastation of hurricane Maria last year. These investments in agriculture and housing also represent vital components of our plan to make Dominica the first climate resilient nation in the world, said Dominica Prime Minister, Roosevelt Skerrit. The Emergency Agricultural Livelihoods and Climate Resilience project (US$25 million) will help farmers and fisherfolks to restore their agriculture and fishing production and systems, and adopt climate smart practices. The Housing Recovery project(US$40 million) will focus on rebuilding houses and improving the application of resilient building practices. The total $65 million project financing for these two projects includes the US$ 50 million of grant financing. "Last year was a stark reminder that the Caribbean is a region most exposed to natural disasters," said Tahseen Sayed, World Bank's Country Director for the Caribbean. "Through these projects we have an opportunity to contribute to Dominica's efforts to build back better and smarter, with structures able to resist high winds, and help some of the most vulnerable including farmers and fisherfolks to cope with the shock and be better prepared for the next storm. We are committed to deepen our partnership with Dominica in support of its aspiration for becoming a climate resilient nation." About 1,700 families will receive subsidies from the housing project and 4,900 farmers and fisherfolks will receive support from the agriculture project. In the immediate aftermath, the World Bank mobilized a disaster risk management team to help the Governments of the most affected islands, Antigua and Barbuda and Dominica, to conduct rapid damage and needs assessments, in collaboration with the United Nations, the European Union, the Eastern Caribbean Central Bank, the Caribbean Disaster Emergency Management Agency and the Caribbean Development Bank. The assessments were delivered in time for the CARICOM donor conference coordinated by the UN. At the same time, US$7 million contingent emergency response component of an existing emergency project was immediately activated in Dominica. In the Caribbean, many financial tools developed by the World Bank are being used to get quick access to finances for reconstruction. These include emergency funds, insurance instruments, and contingency lines of credit. Eight countries have received payouts of more than $50 million from the Caribbean Catastrophe Risk Insurance Facility, a regional risk pooling mechanism. Dominica received a payout of US$19.3 million after Hurricane Maria. 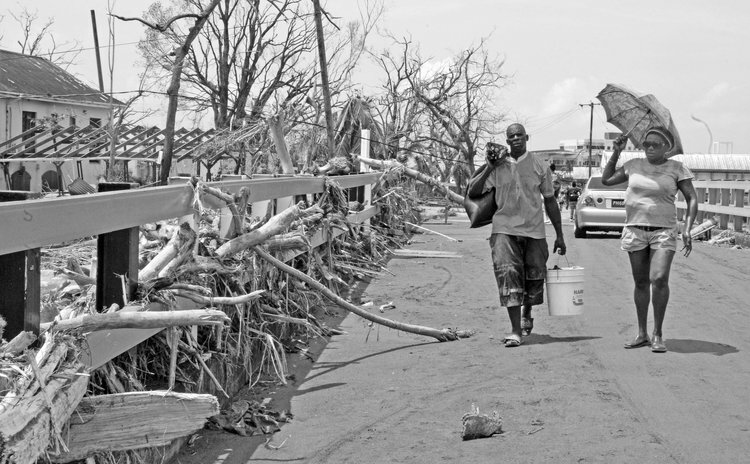 Currently, the World Bank Group is supporting Caribbean countries with almost US$1 billion focused on strengthening resilience and financial protection against disasters – of which nearly half a billion dollars is focused on disaster risk management (US$430 million).In addition, the World Bank Group is engaged in Haiti with more than US$935 million.